Electrical measurements of high power discrete devices like power transistors, power diodes, thyristors etc.. designed in vertical and/or lateral device orientation, or even high power amplifiers. Measurement conditions required more than 500V (high voltage) and/or 1A (high current) in pulse or DC. MPI’s High Power Probe System provide accurate measurement of high power devices up to 3 kV (triaxial)/10 kV (coaxial) and 400 A (pulse) even at the elevated temperature of up to 300 °C. MPI’s gold plated high power thermal chucks with evenly distributed vacuum holes located across the chuck to secure thin/warped wafers down to 50 µm and provides excellent backside wafer contact while achieving low contact resistance for vertical device RDS(on) measurements. Multi contact High Current Probes not only reduce the probe contact resistance but also avoid device pad burnout usually associated with single needle probes by distributing current. MPI’s high voltage probes are design to withstand up to 10 kV for low leakage device breakdown measurements. To suppress high voltage measurement arching, MPI solutions include specially design trays for Fluorinert™ liquid or dedicated ant-arcing probe cards. 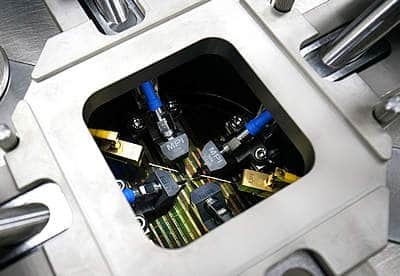 MPI’s High Power Probe Systems are designed to integrate with various test instruments, such as Keithley or Keysight SMUs, and provide fast system setup for various device test conditions.